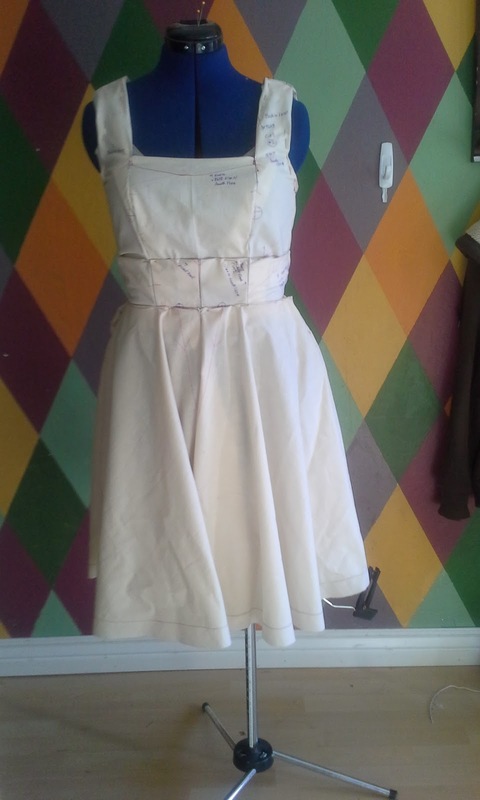 It feels great to have finished my muslin! I am using Susan Khalje's directions from her class, The Couture Dress on Craftsy. I plan to do a full review of this class when I finish the dress. So far, I love the class. I have watched it all the way through, but I am now rewatching as I am actually sewing. I really love the way this dress feels and looks. This is Vogue V8648 view E. I did some modifications for my taste and for fit. I am a bit modest and since this is for the Little White Dress Contest on PatternReview.com, the rules specify that the dress be classic and can be dressed up or down. The front was raised 1 inch. I really like the square neck, but I really felt that it was borderline for me. The corners showed the bra that I intend to wear. I was also concerned that if I lost more weight, it would no longer be acceptable. I also don't like to feel self-conscious about leaning forward, which I think I would have. I have also decided to go without sleeves. I am making this dress with the expectation that I will continue to lose weight and feel that the sleeves will make that more difficult. I also raised the back. I usually have trouble with keeping the shoulders in place when both the front and back are low. This was happening before the back was raised. It was interesting trying to adjust the back by myself. 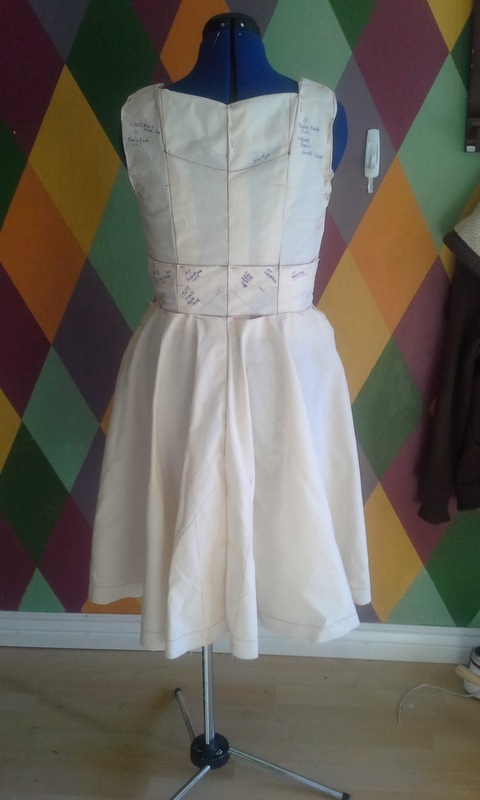 I extended the back muslin piece before sewing. I pinned it in place on my dress form, Dorothy. 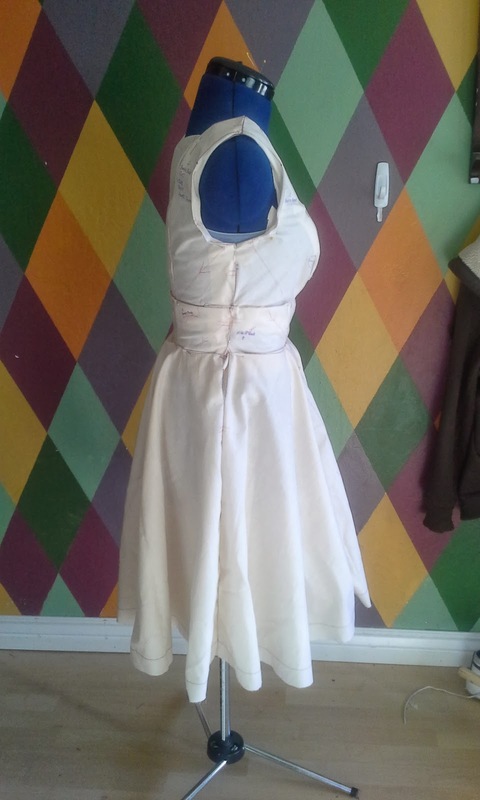 Since this was a muslin that I was still making design changes to, and I was fitting myself, I sewed the back all the way up and used the left side open to attempt to pin myself into. I had to take the dress on and off several times to adjust the back bodice piece, but I finally did it. And with only one pin stick! As exciting as it was to have a completed muslin, I was also saddened that I had to rip it apart. I did label each piece with all relevant information, including left or right. It is now all pressed and waiting to be used as a pattern for my underlining. Maybe I will get to do that today! Now for an introduction to Dorothy, my dress form. I've had her for a couple of years and she has spent some time in the corner because I was sewing for others. Once she was out of the corner, I spent about half an hour attempting to adjust Dorothy. I lost some weight and she reaped the benefits of losing some inches too. Our measurements didn't completely match up after I finished. I did take some very awkward pictures with me wearing the muslin, but it with pins threatening to poke me and the twisting involved with lining myself up in a mirror while the holding a camera....Dorothy's pictures will have to do.